[Editor’s Note: Magnolia Pictures opens the film in limited release beginning Friday, July 25 in New York with a larger roll out in select cities August 8.] “Man on Wire” is the perfect example of matching doc director to doc subject. 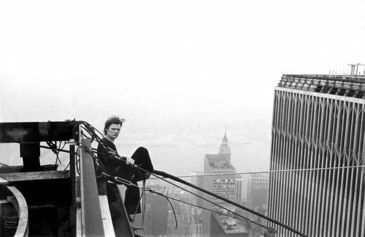 French tightrope walker and juggler Philippe Petit became world-famous when he walked between the two World Trade Center towers, then under construction, on August 7, 1974 — a completely illegal if fantastic act that involved complex preparation and shook up New York City’s police department. (He had to cross back and forth several times to avoid the cops.) Petit had already achieved artistic notoriety for his feats at famous sites like Notre Dame in Paris, but to traverse the air space between what were then the world’s two tallest buildings? It’s not only his unbeatable skill, though, that makes Petit an ideal subject for a doc: He is a ball of fire, a fascinating egomaniac who engages you completely with his energy and confidence. Petit has written several books, including To Reach the Clouds, which recounts the feat in downtown Manhattan. British director James Marsh, who, like Petit, lives in New York, is just the opposite. He is grounded and oozes intelligence and, well, taste, without self-consciousness. His personality is imprinted on the film almost as much as Petit’s. The film is chock full of re-created scenes — how else could one make a film about something that took place 34 years earlier? — that are aesthetically rich but unpretentious. And this lack of self-consciousness, even in reconstructions, is the perfect form for the story of someone with Petit’s oversized ego and talent. Marsh was able to enrich the narrative by including interviews with those who took the risk of assisting Petit at the time, artistic criminals, if you will, most of whom became estranged from Petit after he achieved his goal. Incidentally, Marsh is so unassuming and such a non-self-promoter that you have to dig to discover that this is the same James Marsh who made the legendary “Wisconsin Death Trip” (1999) and, the embodiment of social consciousness, directed “The Team” (2003), a doc about homeless men in New York City who attempt to compete in the Homeless World Cup in Austria. 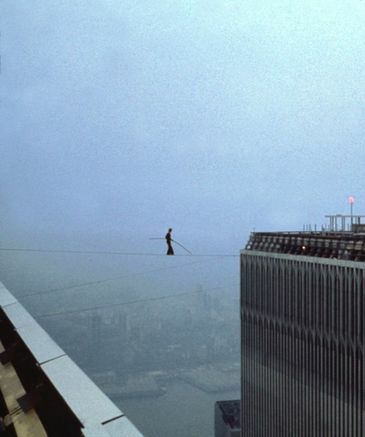 indieWIRE: How did “Man on Wire” come about? James Marsh: I knew about the story, but I think more than anything Philippe felt it was time to tell his story. But we had to see if it worked out, if Philippe and I were comfortable with each other. We spent a lot of time together and talked about films we like. That was part of our dialog. And what kind of music we liked. It was a very human way into it. iW: Did you two collaborate on the actual making? PP: Certainly I did not collaborate on the technical side. James asked me questions based on the book. JM: Philippe set the tone of the film, the way the story played out. There were certain ideas that were Philippe’s, like toward the end, when we are on the roof and the security guard comes up, while Philippe is hiding behind the curtain. It works beautifully. That’s the level of collaboration, without a lot of dialog. The tone and the playfulness and the magic of the story comes from real life. Philippe is a great storyteller on camera. He wanted to tell his story in this way. So I said, Okay, I’ll do it. I was liberated by having a subject act things out. That frees the camera and allows the subject to tell the story his way. I wanted to embrace that. A scene from James Marsh’s “Man on Wire.” Photo: (c) 2008 Jean-Louis Blondeau / Polaris Images. iW: A number of docs are using re-creations, as you do, even though not everyone in the doc scene finds them acceptable. JM: I think that debate is one that will be ongoing. I felt that having the resources of cinema at one’s disposal, you should use them. I think that re-creations were the best way of telling the story. I don’t think one should be overly puritanical about how you tell a story. “The Thin Blue Line” has very baroque, very artful reconstructions, but the truth was that someone got out of jail because of Errol Morris‘ work. You can’t argue with this deeper truth. I think Philippe has always approached Werner Herzog‘s “ecstatic truth,” which touches my heart, too. In fact, Philippe and Werner are friends. PP: I wanted the book upon which this film is based to be in a style that would be an homage to Werner. iW: Granted this is from re-creations, but when you and your “accomplices” are setting up your equipment in one of the World Trade towers, it seems like most of the others are nervous, but you have confidence. Did you? PP: As far as planning and bringing in equipment without getting caught, and staying up there all night, I was full of doubt. But regarding the walk itself, I had certitude from the very beginning. Having learned by myself so many arts, and having fought in my own way to express myself as an artist, I acquired this certitude even in the midst of doubt. Maybe in the midst of doubt I feel I’m really going to make it happen. iW: Is it the Heisenberg Principle that states, if something can go wrong it will go wrong? PP: Well, in America I discovered that possibility. JM: The same with filmmaking as well. One is always one step away from disaster. Every endeavor that involves a group of people, when the objective is not certain, you can’t predict what happens. I always see it as a miracle, to see Philippe in this way. It’s like he used his will to make it all happen. What I like about the film is that it shows that the impossible is possible. iW: How long were you up there? PP: Forty-five minutes, according to my friends who saw me from the first step. They told me I did eight crossings. I started on the south tower and ended up on the south tower. iW: Was that your intention? PP: No. I did not even know what kind of performance I would be able to do. I wanted to perform, I didn’t want to just walk across and brag, “I did it, I did it.” I wanted to make one crossing against the sky and do some kind of performance up there. iW: Did you figure out in advance how you would make the film? JM: From various interviews I got a feel for America at the time and for Philippe, and then I had to figure out how to bring that to life as a piece of visual filmmaking. I had no real plan. I was just trying to find the stuff and respect it. I did think the film might pick up on the criminal conspiracy element and make that the genre, but pinning people down about that proved rather difficult. iW: You never mention what happened to the towers on September 11. JM: It would be clumsy if Philippe or I would begin discussing the collapse of the towers. That is a terrible story and a different story. It would have been a spectacular mistake.